Diva has her Grand Hunting Retriever Champion title with HRC and Master Hunter title with the AKC. She was the youngest chocolate and only chocolate female to pass the 2011 Fall HRC Grand in Canada, and picked up her 3rd Grand Pass at the 2012 Fall HRC Grand in Oklahoma. She is also qualified for the 2013 Master National, (three consecutive qualifying years)! Diva earned her HRC Upland Hunter (UH) title in the spring of 2013. Diva has qualified for the 2014 and 2015 master nationals. In October 2013, Diva received a JAM (Judges Award of Merit) at the very first AKC Field Trial Qualifier event in which she competed! Diva is a beautiful 65 pound female that is full of style, power, ability and talent. She is impeccable at both marking and blinds. She runs just as hard on blinds as she does on marks. 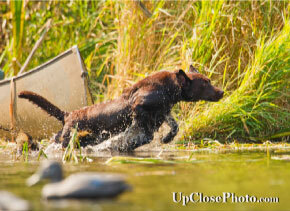 Diva is a joy at the line or in the duck blind. She is very calm, but is a fireball as soon as she is released. Diva hunts in the off season as well. 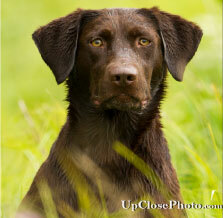 She has hunted ducks and geese all the way from the freezing waters of Colorado to the rice fields of Louisiana. She also hunts pheasants in Colorado and Kansas. She is amazing to watch in the upland field. Diva is not only a good field dog, but she is also a great house dog. She enjoys grabbing a bone and lying in her chair or in our laps to relax.